Drugs have been part of our culture since the middle of the last century. Popularized in the 1960s by music and mass media they invade all aspects of society. You probably know someone who has been affected by drugs, directly or indirectly. Or maybe you have experienced their effects yourself. People take drugs because they want to change something about their lives. They think drugs are a solution. But eventually, the drugs become the problem. What should YOU know about drugs to keep yourself and the ones you know off of them? Find out how drugs work and how they affect the body and mind, why people take them, and the effects of the most abused substances. 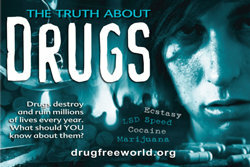 Request your FREE copy of the booklet, The Truth About Drugs. I agree to the Privacy Notice of this site. I would like to be contacted by telephone. I would like to be contacted by mail. Please allow two to four weeks for delivery. Your privacy is very important to us. We will use the information submitted solely for the purpose of processing and following up on your request.